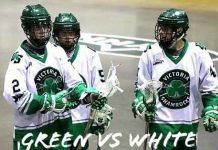 Victoria, BC – The Shamrocks are pleased to announce that we have acquired two graduating junior A players from the Rocky Mountain Lacrosse League in Alberta. Jake Archdekin, a big, rugged defender from Calgary who was captain of the RMLL champion Calgary Mountaineers and a key contributor to their breakout performance at the 2016 Minto Cup. Tristan Rai (pronounced Rye), a right shooting offensive player from Edmonton who racked up 75 goals and 93 assists for 168 points in 65 Junior A games with the Calgary Raiders in Alberta and the Whitby Warriors in Ontario. 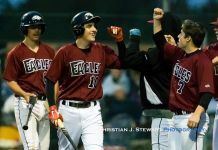 “I expect Jake and Tristan will both fit very nicely into our group,” said Shamrocks general manager Chris Welch. “They fill positional needs that we have going into the 2017 season and they appear to be ready for Senior A. Jake adds size, toughness and leadership potential to our back end while Tristan comes with glowing recommendations from his coaches Andrew McBride and Dane Dobbie. Alberta is producing some high quality lacrosse players and we think we got the two best available this year,” said Welch. Archdekin will arrive in town in time for the start of training camp and Rai will arrive right around the start of the season when he finishes school at Lehigh University in Pennsylvania.